Are you a fan of Graffiti Art? I don’t mean the needless vandalism of property ‘graffiti’ I mean actual Art with a capital ‘A’ as in the graffiti style. There are so many talented artists, Selwyn Senatori being one that I have actually met! We love graffiti in our house. I even wrote an easy DIY for you to do in your own home. Of course Banksy is the most famous graffiti artist in the world, most people know his name, but does anyone know his real name? Have you heard of Stik or even JR? Better get googling then…! I don’t mean the needless vandalism of property ‘graffiti’ I mean actual Art with a capital ‘A’ as in graffiti style. I remember the stencils of the 90’s do you? Flowers and borders and lots of fancy stars. I didn’t really see the point back then. 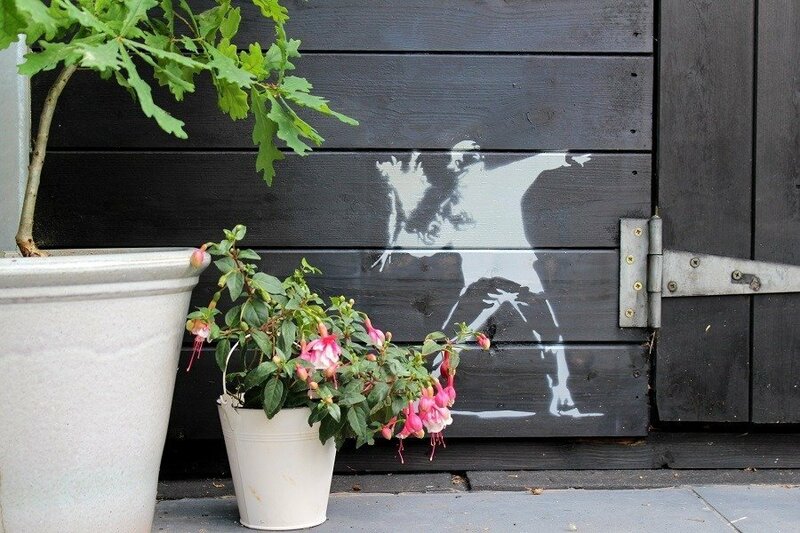 Now however, stencils are having a new moment. They are back but with a difference. you can buy huge mandalas to decorate your walls and there is a Banksy for everyone. 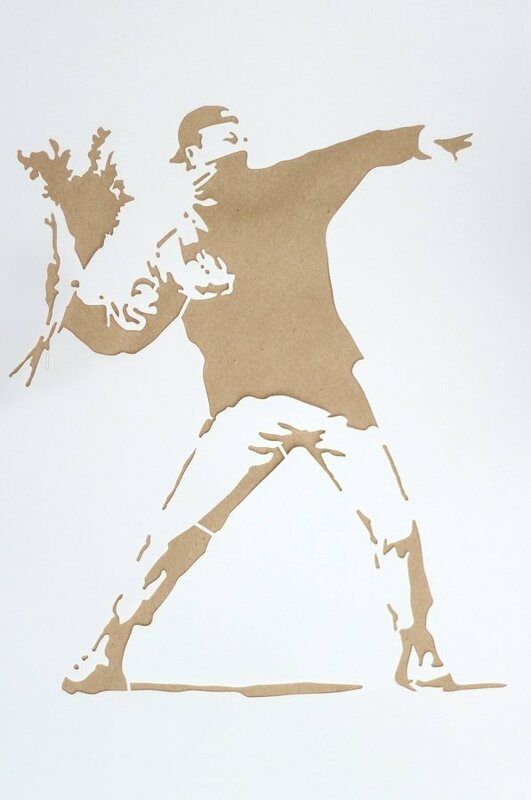 I chose Banksy’s ‘Rage Flower Thrower’ in an 18″ x 12″ size. I knew exactly where I wanted to place it. On our Black garden Shed! I also chose a huge Mandala, I have plans for this one inside the house. All the stencils are reusable, made from 10 ml mylar a strong plastic, simply clean and reuse. I find the details fascinating, obviously i know this is no a real Banksy but you can clearly see this guy has his baseball cap on back to front and is using the neck of his jumper as a mask. Your choice of stencil obviously. A temporary glue/and or tape, we used the spray mount glue that picture framers use. 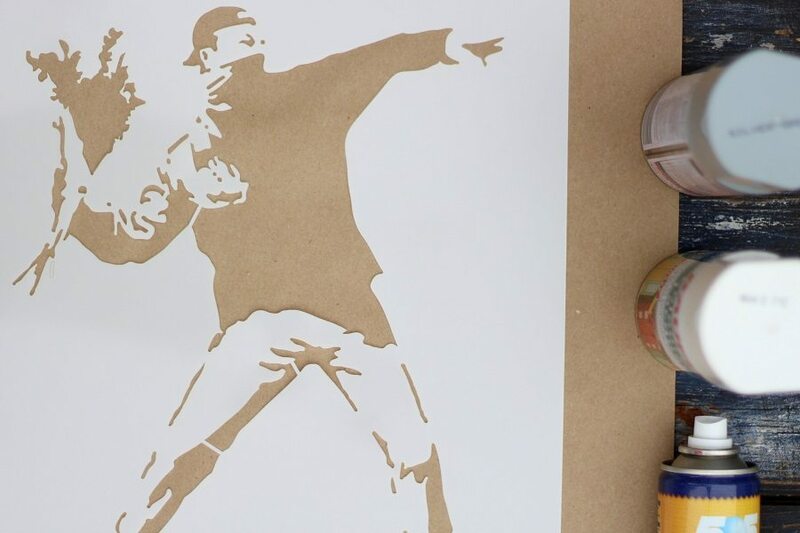 Spray the temporary adhesive to the back of the stencil, lay it on a piece of paper first to stop any mess. Carefully press in place be sure to check all the details are pressed flat to the surface, for a good finish. Mask edges to stop the frame showing, spray slowly and evenly from side to side, you dont want any drips! 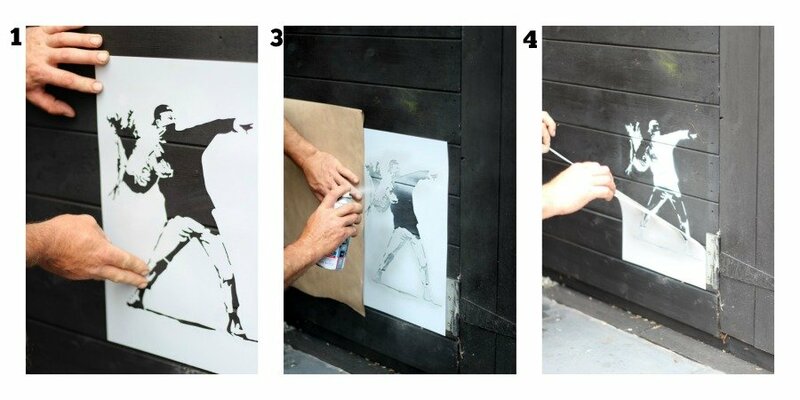 Carefully remove stencil BEFORE the paint dries. We turned the image around so it looks like the protestors are throwing flowers at each other! Clean very carefully after use, see spray paint info on the cans for how to clean. …runs up to me every time I get the camera out in the garden. He then assumes a pose and will not budge, I kid you not! I recently popped a pic of this up on my instagram account did you see it? 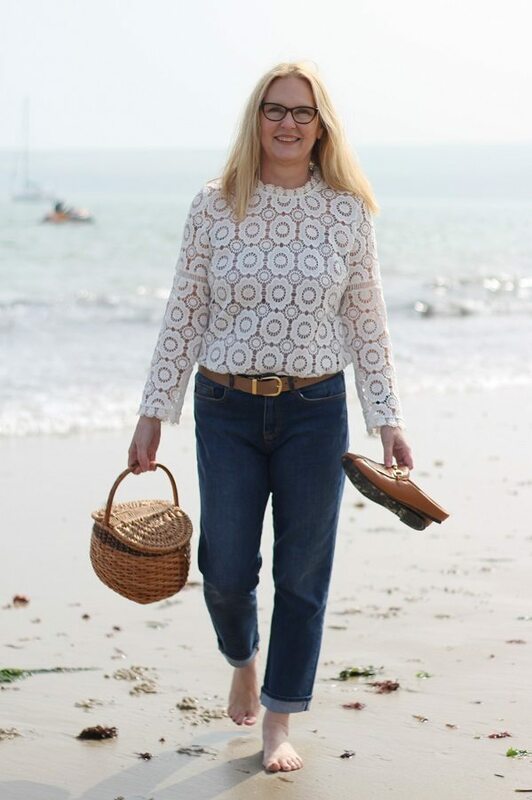 Have a super week! How are you managing to stay cool? Hi MT yes and I love your new wall stickers fabulous with a capital F! 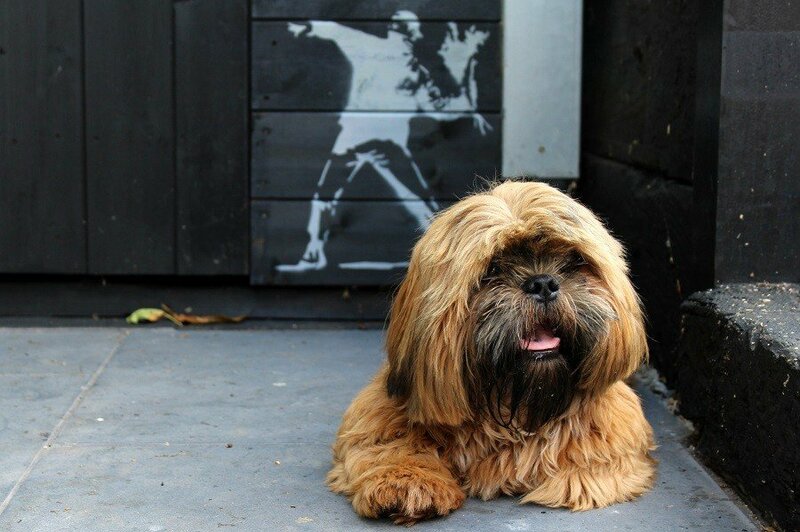 I have said it before, I love that Banksy stencil! 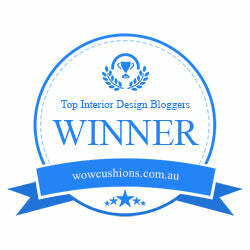 It looks fabulous! thanks Nancy its lots of fun isnt it? Wait till you see the next one! 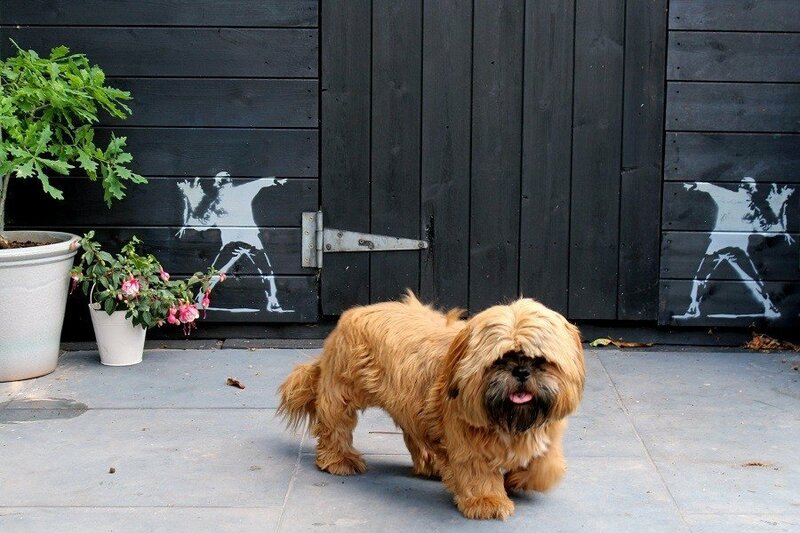 So pleased you sent her the link, that company have lots more Banksy stencils too and very reasonable prices!